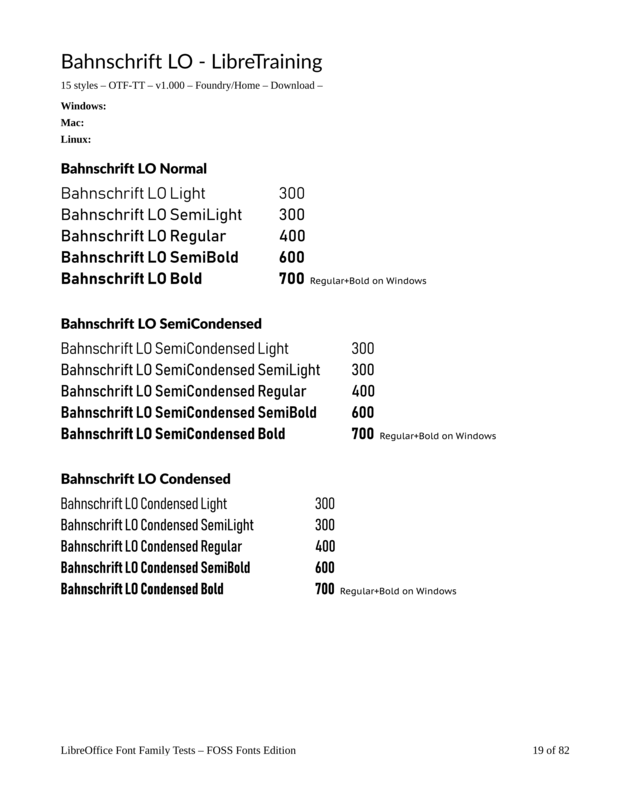 Bahnschrift is a standard font for Windows 10 since Fall Creators Update and I really like it. Unfortunately it can't be used correctly with Publisher as all font styles are detected as "Regular". Other fonts seem to work properly. Bahnschrift is a variable font, a relatively new kind of font which is not yet supported by the Affinity apps. At present we can only use typefaces where there is a separate font file for each style. Ok, this means even Affinity Photo does not support that? Nice to know. This surprises me as my copy of Photoshop Elements 12 seems to have no problem with that. I hope devs are aware of this problem and work on that. This, in turn, surprises me! My copy of Photoshop Elements 13 offers me ‘Bahnschrift Regular’ instead of ‘Bahnschrift’, and the dropdown list for the style is disabled. This, in turn, surprises me. My copy of Photoshop Elements 13 offers me ‘Bahnschrift Regular’ instead of ‘Bahnschrift’, and the dropdown list for the style is disabled. Oh, yes, you are absolutely right. I did not notice a problem because somehow the buttons for making the font bold or italic work. But now I figure out it's not really the bold version of the font, but PSE does some magic with it. Comparing "Arial Bold" with "Arial Regular" and the bold button deliver different results. "Character Traits" for "Bold" and "Italic" for some reason. Ok. Affinity is not that bad. I take back my rant. Thought I'd jump in with my 10 cents worth here. My version of MainType (Pro 7.0) doesn't like Bahnschrift one little bit and consistently wants to remove it from the registry. The error being—Installed, but not loaded. From what I understand it's a system font that's pertains to Windows 10. Assumably it's broken and Microsoft can't be bothered fixing it! It can't be uninstalled. Faux bold often doesn’t produce good results, even with a sans-serif font. Time to upgrade, perhaps, Peter? MainType 8.0 Pro seems to be quite happy with Bahnschrift on my Windows 10 system. Oh, it's more likely to be some issue on my Windows 10. The font is not, and never has been, available to me in any of the apps I use. It just doesn't appear in the font lists. In XaraDesignerPro it shows all weights. Devs, i support for variable ﻿fonts somewhere on your roadmap? FontLab has a feature to quickly export all the defined weight/width combos of a variable font. It worked great ... except that the font names were completely wacko. Fixed the font names in TransType. Three widths: Condensed, SemiCondensed, and Normal. Five weights: Light, SemiLight, Regular, SemiBold, and Bold. Total of 15 font files (in file below). I installed and tested in LibreOffice. All seem to be working OK. Please test in APub and report back here. @LibreTraining Thank you so much, you are great! This works in Publisher. I can use it now. They look as in your test page. Really nice work! Until Affinity supports variable fonts I think you helped a lot of people with that! Can you please upload again your link with the Fonts? Please add this improvement to the database,as without it the font cannot be used properly, exposing the bug in the screenshot. Bahnschrift looks like a copy of DIN. Probably because that’s exactly what it is! It’s Microsoft’s digitization of DIN 1451 as an OpenType variable font. I think it might be useful if a moderator pinned a note about this to the top of the forum. It could help to stop this issue from being posted repeatedly, or as much. It doesn’t need to say much more than: “Variable fonts – such as Bahnschrift – aren’t supported yet.”, maybe with a list of well-used fonts that people can search for to get to the post itself.